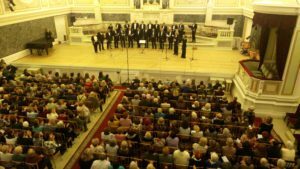 On October 16, 2016 SLAVYANKA Russian Chorus performed in St.Petersburg State Capella. The concert hall was absolutely full and cordially welcomed American guests. The combination of Russian and American music proved once again that music is a human international language without any boundaries. 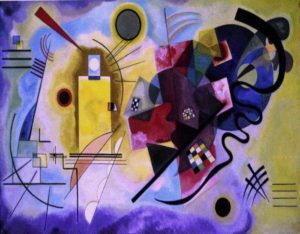 Ror the first time the oeuvre of Wassily Kandinsky (1866–1944), the world-renown Russian artist, is represented with special emphasis on the national origins of his early figurative works and abstract paintings of the 1910s. 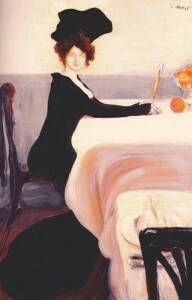 The exhibition, dedicated to the 150th anniversary of the artist, is comprised of his graphic and painterly works alongside with the pieces by his prominent contemporaries (Ivan Bilibin, Elena Polenova, Sergei Malyutin, Mikhail Larionov, Natalia Goncharova, Kazimir Malevich, David Burliuk, Alexey Yawlensky, Marianna Verevkina and others). These artists together with Kandinsky in the Izdebsky Salons and “The Blue Rider” group exhibitions and reflected the symbolism, expressionism and art nouveau trends. The exposition will also include the examples of traditional Russian folk art (distaffs, birch bark boxes, embroidered towels, toys, carved wooden items) that largely influenced the stylistic and ideological principles of Wassily Kandinsky’s art. The works on display are selected from the collection of the State Russian Museum, State Tretyakov Gallery, Pushkin State Museum of Fine Arts, Hermitage and other museum collections. 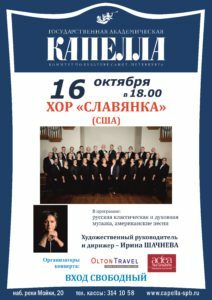 SLAVYANKA Russian Chorus will perform in St.Petersburg State Capella on Sunday October 16 at 6 pm. 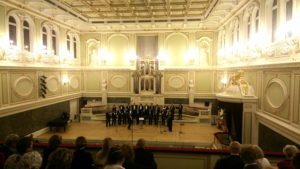 The programme includes Russian sacred and classical music as well as American songs. 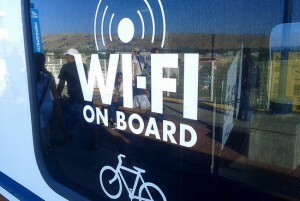 FREE entrance! Would be great to see you there! 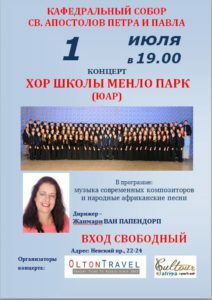 Menlo Park High School Choir (about 100 singers) from South Africa will perform in St.Peter’s Lutheran Cathedral in St.Petersburg on July 1 at 7 pm. The programme includes contemporary music and traditional African songs. FREE entrance! Would be great to see you there! sculptures and pieces of decorative and applied art by A. Benois, S. Sudeikin, A.
A.Agabekov, N. Nesterova, K, Simun, I. Tarasiuk and others as well unique materials from the collection of St. Petersburg Museum of Circus Art. Russian Museum, Benois Wing, February 24-May 16, 2016 Léon Bakst (1866-1924) is a world-known master of painting and drawing. 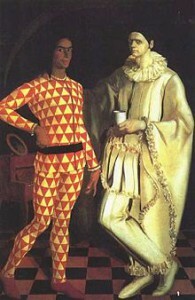 His designs for costumes and sets contributed a lot to the success of Sergey Diaghilev’s “Les saisons russes”. The exhibition dedicated to the artist’s 150th anniversary presents around 100 works from the Russian museum and other museums. On May 2-3, 2016 St.Petersburg will host the 3rd Icebreakers’ Festival. 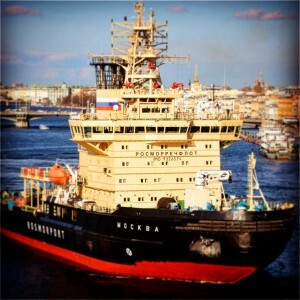 You will be able not only to visit the most powerful operating Russian icebreakers, such as “Vladivostok”, “St.Petersburg”, “Ivan Kruzenschtern”, as well as the museum icebreaker “Krasin”, but also take a boat ride and admire the icebreakers from the water. Icebreakers’ Festival is a unique world event as it takes place only in Russia. 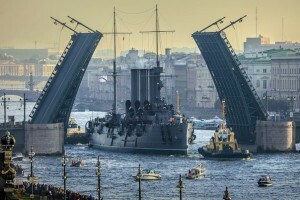 The legendary cruiser Aurora, one of the St.Petersburg symbols, which has been under complete restoration since 2014, will return to its docking place near Nakhimov Naval School this summer. You will have a rare chance to see cruiser Aurora sailing on the Neva river. The on-board museum devoted to the history of the Russian Navy is being updated to be turned into an interactive multimedia exhibition. 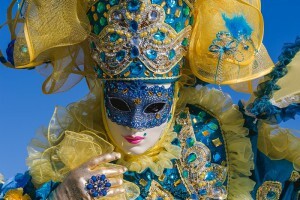 More than 100 photographs of the Venice Carnival, taken by the prominent Russian photographers such as Mikhail Shemyakin, Alexander Tiagny-Riadno, Vladimir Balabnev and others, capture the subtle and eternally elusive image of Venice and express the festive and playful atmosphere of the carnival and its very spirit.